Route: Honokowai Marketplace to Nakalele Blowhole and back. See Google Maps. 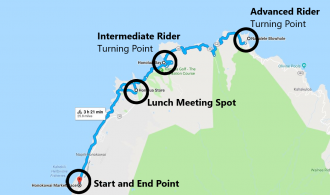 Alternative: Intermediate riders and those who would like a shorter course have the option to turn around in Honolua and reconvene with the rest of the group at the Kapalua Honolua Store (502 Office Road) where they may choose to purchase food, drinks or other refreshments. Distance: Approx 12.5 miles each way, 25 round trip. See Google Maps. Alternative: The intermediate route (turn around point in Honolua) will be approximately 7 miles each way, or 14 miles round trip. See Google Maps. Expected Duration: 4 – 4.5 hours including scenic stops and time for lunch. Gear Rentals: Electric bikes available from Ridesmart Maui, standard bikes available from Boss Frog’s. Please call ahead to arrange your rentals and bike delivery in advance. This event is a part of the Maui Cycle Exploration Project, a monthly ride series supported by Hawaii Tourism’s Community Enrichment Program. Learn more!